Secular Pro-Life Perspectives: Are You Watching? Often in order for a person to be upset over something, their thinking has to be altered in some way or another, whether it be by a person’s story, a personal experience, or even a picture. Unfortunately the majority of us do not care about the major issues of our day until we are confronted with something that either impacts us personally or unless it pulls at our emotions. An example of this is the outrage that has been taking place across the world these last few months over human rights issues in China. 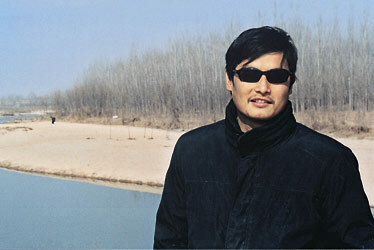 For years Chen Guangcheng, blind self taught lawyer, was persecuted for his efforts of exposing the injustice of forced abortion and sterilization in a Chinese village. Finally, after many years of imprisonment and torture, Chen and his family have been reunited and have found refuge, for the time being, in the United States. Chen is just one of many who have been isolated, beaten, and silenced for exposing the truth. The world was silent until this man’s story hit a climatic point after he escaped his confinement. Yet, because people across the world spoke out, much was accomplished in helping Chen and his family after years of suffering and continued injustice by China’s One Child Policy. Now, two more stories have been shared of the enforcement of China’s One Child Policy. Feng Jianmei on June 3rd was beaten, taken from her home by family planning officials, and her seven month pre-born child was forcibly aborted. The dead child was left on the bed next to her. This story is beyond tragic and difficult to face, but this is really happening. The world is outraged by this situation and people are speaking up. June 6th, another woman in China, Cao Ruyi, was also forcibly taken from her home and beaten by family planning officials for violating the one child policy. Because of the international attention of Cao’s story the woman with her five month pre-born child were allowed to go home; however, only after she paid a fine for violating the one child policy (approximately $1,500 US) which will only be returned if she aborts her unborn child. In addition, Cao and her husband Li Fu will have to pay the equivalent of $25,000 for the “social burden compensation fee” if they choose to keep their child. What on earth is happening to our world? How does forced abortion of a seven month preborn child or charging that couple over $26,000 if they do not abort their child, make sense? YES, we should be outraged and YES we should do something. We cannot keep turning a blind eye to what is happening around us. Does the truth have to be thrown in front of you with horrific pictures and stories in order for you to do something, or will you recognize the injustice of laws today and say this is not okay? I guess the difference is that we privatize the decision to have an abortion. Of course, if taxes are going to fund abortion, then we haven't privatized payment of that decision, which irks me in general (I'm generally libertarian-leaning) but just outrages me when it comes to abortion. There is still something to be said for America's system over China's, but not much. "Many could say we are just as bad as China in the United States" We are! It was only in 2007 (?) that we made Partial Birth Abortion and the Born Alive Infant act ILLEGAL! Thank you for sharing your perspective on United States-China relations. I appreciate hearing from you. I believe there is much to be gained from a closer working relationship with China. Indeed there are very few global challenges, if any, we can address effectively without China’s active cooperation. They are a global economic power, and engagement with China’s government is an important step in stemming the financial crisis that has devastated economies around the world. Both of our nations seek to lay a foundation for sustainable growth and lasting prosperity. My Administration is also working with China on a number of security issues, including stopping North Korea’s nuclear program, rolling back the advance of extremists in Pakistan, and ending the humanitarian crisis in Darfur. The United States and China share common interests on a host of issues—including energy security and climate change, food safety and public health, and nuclear non-proliferation and counter-terrorism. We want to work with them to address these issues in the years ahead. Improved relations with China will require candor and open discussion about those issues on which we may disagree. We must address human rights, democracy, and free speech. We must also work to ensure that our nations play by the rules in open and transparent economic competition. These important matters will be essential elements of our ongoing dialogue with China. For more information on my foreign policy agenda, I encourage you to visit: www.WhiteHouse.gov/issues/foreign-policy. This has been going on for many, many, many years--and we continue to condone China. I'm not a praying man, but if I were it would be for Timmerie Millington to get arrested for disorderly conduct.